Hays County planners looked at a number of trends while developing the two bond propositions now before voters. Data reviewed by planners and, ultimately, the Hays County Commissioners Court, included detailed studies that stack more than a foot high. The five members of the Commissioners Court voted 5-0 to submit the proposals to voters. Below are a few samples of key trend lines that planners and the Commissioners Court considered before placing Propositions 1 and 2 on the ballot. Hays County population was relatively stable for decades, but beginning in the late 1970s and early 1980s the county began a long curve of rapid growth, a trend that has only accelerated in recent years as Hays County became one of the fastest growing counties in the United States. The first chart below shows historic county population benchmarks through 2015, with projections through 2040 based on the most recent numbers adopted by the regional Capital Area Metropolitan Planning Organization (CAMPO). The next graphic (below) is also from CAMPO. Though several years old, it’s a useful illustration of what growth may look like. Each dot represents 500 people. On the left is population as of 2000, on the right is projected population for the year 2040. So far, population is growing faster than was anticipated under the scenario on the right, but the chart has not yet been updated. 201 0 Population Dot Scatter chart from the Capital Area Metropolitan Planning Organization. 2040 Projected Population Dot Scatter chart from the Capital Area Metropolitan Planning Organization. Most demographers see Hays County’s growth as part of a broader trend within the Austin-San Antonio corridor. 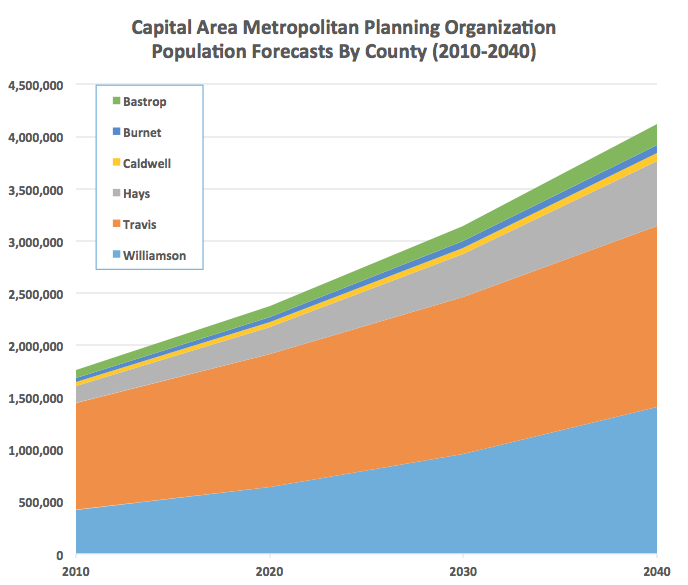 This chart shows how regional planners expect Hays County – in part because of its location – to grow even faster than most of its neighbors in the coming decades. The greater Austin area is projected to become an urban region of about 4 million people. Change is happening across the county, as the following scatter chart indicates. Dots represent development permits over the last few years – and larger dots represent more permits. The greatest development concentrated along Interstate 35, in San Marcos, Kyle, and Buda. It’s important to note that state law in Texas gives counties less authority to control or deny development than in many other states. Here, counties have the authority to ensure certain standards are met and are responsible for providing adequate infrastructure, but except in rare cases Texas counties may not zone land nor turn away new development that meets health and safety standards. Growth is market driven. Residential Growth chart from the Capital Area Planning Organization showing trends from 2009 - 2013. Population growth and the county’s position as the crossroads of a dynamic region have driven increases in traffic on major arterials in the county. The graph below tracks increases in average daily traffic on a few well-known arterials over the decades. Many smaller county roads have seen similar – or even greater increases. Emergency calls to the county’s 9-1-1 center, and the number of inmates in the county jail have also been affected by rising population. The county’s current jail is based on bonds voted by Commissioners Court in 1986 (without asking for voter approval). The jail was built for growth, and for years there was extra capacity. At times the county even rented jail bed space to other counties or to the federal government. Over the years, as the jail became full with local prisoners, the county adopted aggressive strategies to manage the jail population – using “cite and release” and other tactics such as veterans courts, mental health referrals, and expedited hearings to minimize the number of non-violent misdemeanor offenders held in the Hays County Jail, and to reduce the amount of time they spent locked up (away from families and jobs) at taxpayer expense. This chart (below) shows how Hays County has built one of the lowest incarceration rates in the state among similarly sized counties. Even with these innovative measures, and with judges, prosecutors and the sheriff’s department cooperating to defer the need for more jail space and keep incarceration rates low, the jail is now far over capacity. The chart below shows the number of “overflow” inmates at over the past two years. “Overflow” inmates are inmates who must be housed elsewhere because there is no room in the county jail. These inmates are often housed 2-3 hours away as beds become available in other facilities – usually with no guarantee those facilities won’t kick them out if they need the space themselves. The inmates must be transported to and from Hays County for hearings and trials, and investigators and attorneys sometimes struggle to schedule time with them. The situation is even more challenging than it looks at first glance because jail administrators must balance space for men and women, 17-year-olds, inmates sick with infectious disease or suffering from disabilities, violent inmates, and inmates who come into the facility suffering from mental illness and depression, and from drug and alcohol addiction. While growth stresses county infrastructure and services, it has also brought opportunity. The graphic below shows growth in jobs located in Hays County, as well as job growth in other counties within the Austin economic market. Meanwhile, Hays County tax base as measure in property values has increased – both because of new construction, and because most properties have seen rising values. The county tax rate has been relatively flat, actually decreasing slightly. Among Texas counties, Hays County’s tax rate is about the middle of the pack.